Saturday the 9 of May is the opening of Lennart Alves’s new exhibition ”210 Bottles”. The name describes the number of imaged bottles in the exhibition and also refers to Andy Warhol 210 Coca-Cola bottles. In addition to having bottles that common motives Lennart Alves also chosen to make one of the images in the same size as Warhol, which measures 145 x 209 cm. The exhibition is an evolution of what I showed at Ystad Art Museum and consists only of cyanotypier. Like that exhibition, these new motives are also based on trash, but this time only by the bottles I collected along the Barents Sea and the Baltic Sea beaches. The photographs are photograms, which means that there is no negative and that each image is only available in one copy. What interests me in these images is their duplicity. The photographs are both poetic abstractions and concrete images. They live in the borderland. In addition to the obvious paraphrases of Warhol, as the exhibition like the one in Ystad, this is also a tribute to the photo pioneer Anna Atkins, says Lennart Alves. WHEN: Opening Saturday, 9 May at. 12:00 to 16:00. 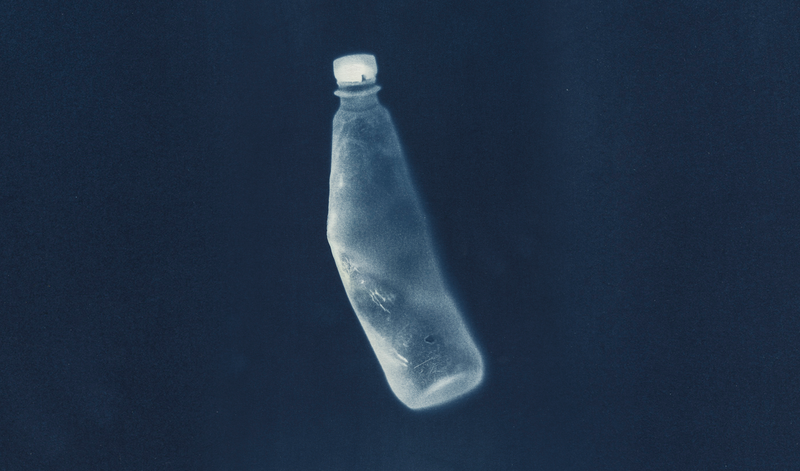 HOW: The exhibition ”210 bottles” will run until Sunday May 31. Opening hours Friday 13-17 and Sat – Sun 12-16, or by appointment.